Yes, I am moving my blog! Come check it out! So I have been stamping a little. Thought I would share a few inspirational things! Most of my stamping lately has been pretty random, however I am trying to make samples using the retired stamp sets. I am always sad to see some of these stamps go away! I'm trying to use up some of my pretty paper I have been hoarding too. Oh me! 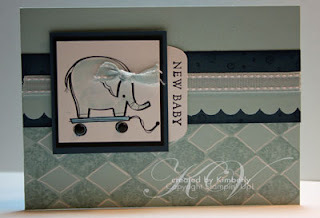 The Baby card uses the Year after Year stamp set. This is a great stamp set for any new stamper. Great to use a blender pen with and color to your hearts content using any type of medium such as a stamp pad or even chalk. This set is retiring. So sad! My FAVORITE background stamp set Print Pattern is retiring as well as the In Colors I used. Shameful! The sentiment New Baby is from Fundamental Phrases. Do you have that? If not, great stamp set. Now, the little pen holder uses the Notebook Designer paper. I love that paper. Not sure yet if this one will retire, we'll see very soon. I wondered into my 3-d alter stash and found one of these large Bandaid boxes and decided it would be perfect to hold my favorite Stampin' Write markers. I love using those to journal with. I wanted them in a tidy place. I used Stamp of Authenticity, another retiring set. I have loved this set. Gosh, is there anything I don't love??? Lastly, I bought some of Starbucks new Chocolate bars and decided to cover one using the Berry Bliss designer paper. I used the One of a Kind stamp set on this little nugget. Well, that's all for today!!! I have to add a big thank you for all the fun comments on my first video tutorial. I know it's a little dark, and I will work on that for the next one. :) Thank you for all your support. I'm working on a new one. whoo hoo! Oh, and to answer someones question, I used Photoshop Elements 5.0 to make my watermark. NOT an easy program to use. Believe me, it took 3 hours to figure it out. Remember, I am blonde. LOL! Jul 10 2008 - Cute Litte Box! I hope you enjoy my first video tutorial! It's a cute little box! 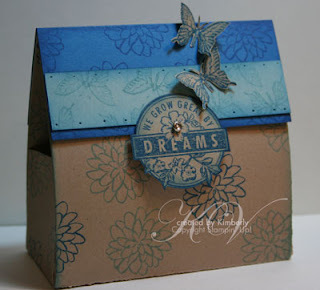 Remember, to make this cute little box you only need 1 sheet of 8.5 x 11 cardstock and then 4 x 4.5 coordinating piece of cardstock for your flap. I hope you enjoy! Oh how I love playing with new rubbah! 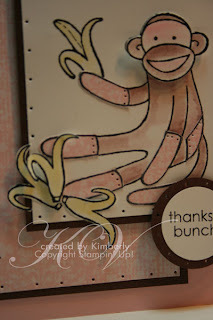 I am in love with the new Sock Monkey stamp set. I am sure this set isn't for everyone, however I love it. Both my kids have sock monkeys that my mom made for them. They sleep right with the kids. I used the new Pink ink and it is so soft and true. I never want it to go away. I thought I would cry to see these current in colors go away, but honestly, I think the new ones are GORGEOUS! Especially the pink. So I colored the monkey in the new pink and Chocoloate Chip. I used the new Bella Rose designer paper. I had a hard time cutting it because it was such beautiful eye candy. 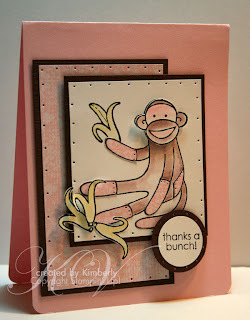 I did stamp the monkey onto the Bella Rose paper and then paper pieced some of the monkey parts. So cute. Enjoy Mrs. Monkey! She is a keeper! Whoo hoo! New rubbah in the house! This is something to get very excited about. Alexis actually beat me to a few of the stamps before I could get my own hands on them. The new In Colors are gorgeous and the stamps I am sampling with is delightful. Here is a little sneak peek at something... 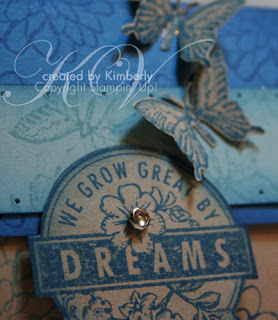 This is the stamp set Dreams du Jour and Fall Flair. Dreams du Jour ought to be a lu lu for me to pronounce at a workshop! Anyways, I used my favorite Kraft cardstock with that gorgeous Pacific Point and Baha Breeze ink colors. Oh yummy!!!! Okay, but BETER yet. Check out my watermarkie thing! I am beside myself. I want to scream really loud, "I DID IT!" Doesn't matter that it took me 3 hours, and less stamping, or that I screamed 3 times when it didn't come out right. Ahhhhhhhhhh... it's done!!!! Now, keep an eye on my blog... there is something coming around the corner that you DON'T want to miss out on!!! Stay tuned! I'm really excited! I just loved making this card last month in our club. This card uses the 5 in 1 Template that Stampin' Up! sells. This template is a GEM. Great things can be done with it and I keep forgetting to pull that booger out and use it. This month I really wanted my club members to see how great this little tool is. 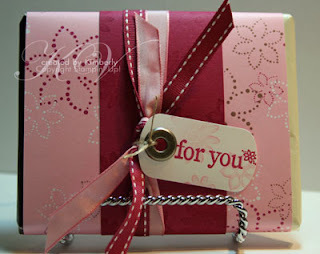 When you open the card, it's actually a gift card holder using the slit punch to keep the card in place. Of course it has a Starbucks card right in it. I love it. 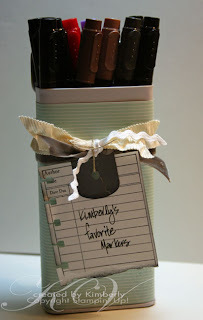 I used the Spunky Spots wheel with Whisper White Craft ink. *LOVE* it. Then of course I used the stamp set PUN FUN with the cute coffee cup. 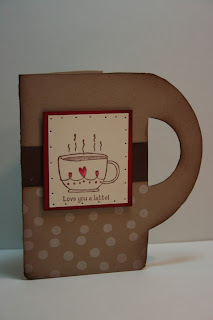 Great card for any coffee lover. That would be ME! Oh, I hate to see this little doggie go! I am a REAL sap when it comes to the dog and cat stamps each year. 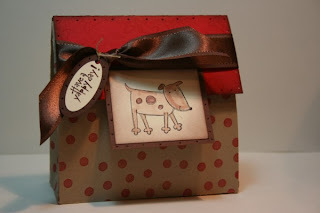 I really liked the doggie stamp set this year. We did these cute little boxes last month at my clubs and the original one I did used a different closure. I had used eyelets and ribbon to keep the box closed and really thought I was dandy with that. The night of club when all the banging was occuring, it dawned on me that VELCRO would work super duper better. :) So, the next club didn't get the eyelets and they didn't mind. LOL! I should send this to my mom for her doggies. I tucked some Scooby Snacks inside. This is probably why my doggie has spent more time in my stamp room. I cannot remember where I got the directions to make this little GEM. I will find it and link it here. You're probably wondering what I am talking about? 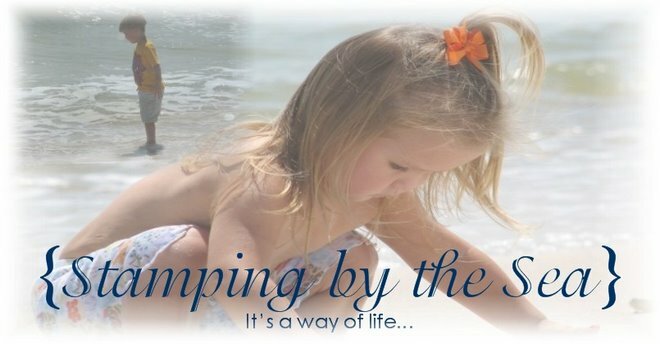 July 1st marks the start of the new year for Stampin' Up! demos! I love this time of year. Convention is getting close, the new catalog is soon to be released and I am just EXCITED! Most importanly I have a huge announcement today! Two of my FABULOUS downline earned the Hawaii Incentive trip! I am so excited for them. I do have an amazing downline. So many great women all over the United States and overseas. WOW! I have been on cloud nine all day! I did get some stamping done tonight. Truly just for me. Just play time. I LOVE doing that. I will share tomorrow. Until then...ta ta!